Before I even start this review, I should say something. I knew when I bought Death Comes to Pemberley that it was poorly received. People do not seem to like this book, either as a Pride & Prejudice continuation or as a mystery novel. But I was weak. I had just seen a fantastic play version of Pride & Prejudice at the Lifeline Theatre with one of my awesome friends, and I was on a serious Austen high. So when I saw the book in beautiful hardcover at a reasonable price at the pretty bookstore, I just grabbed it and decided to heck with poor reviews. Death Comes to Pemberley picks up six years after the events of Pride & Prejudice. Elizabeth and Darcy ("Fizz" to those who know him well. Just kidding.) 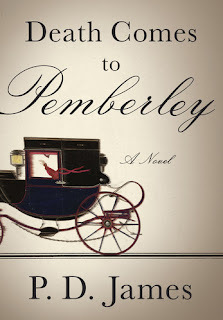 are living a tranquil and ideal life at Pemberley, raising their two boys, preparing to host their annual ball, hanging out with Georgiana and the Bingleys, when Lizzie's sister Lydia comes careening to Pemberley in a carriage, screaming that her husband has been killed and everyone must drop everything to look for him or save him. Darcy ("Fizz"), with much justification, thinks, "Will I never pay enough money to be rid of Wickham?!" and then goes out with his cousin the Colonel to find his ne'er-do-well brother-in-law, who is unfortunately alive while his best friend Denny is dead from a blow to the head which Wickham claims he did not deliver. This obviously creates a lot of Drama, and the story takes off from there. Except that it never really does take off. For the first 57 pages, we hear not one word from Mr. Darcy. We spend the entire time in Lizzie's (not particularly interesting, I am sad to say) head, mulling over what to do about Georgiana's marriage prospects, finalizing guest lists, and fondly thinking about marital bliss. Then Lydia shows up and we transfer completely to Darcy's point of view and never get back in Lizzie's head. And Darcy is REALLY BORING. While in P&P, Darcy is strong and witty, cool and collected, here he is unsure of his footing in his own home, his thoughts on the trial, his family structure, everything. There is so much internal monologue going on that you can easily get lost in the details. So, as a P&P sequel, I would not rate this book highly, mostly because we rarely see Darcy and Elizabeth interact at all, and when they do, it's not in any way memorable. They are just always stressed out (understandably, as there was a murder on their property) and not sleeping well. There also are not many links to the characters from Pride & Prejudice. Jane and Bingley are here, there's a short but fantastic Lady Catherine cameo, and of course Lydia and Wickham make appearances, but that's basically it. James spends about 20 pages of a prologue summarizing Austen's novel for us (why, I don't know, as she doesn't change anything about the novel in those pages), and then drops nearly all of those characters completely. Even when she brings in the Wentworths of Persuasion and the Knightleys of Emma, it's done without much reference to those characters and their current lives at all. But at least James got the mannerisms and speech and tone of the early 19th century right. There is a lot of talk about how loyal people can be to a stately home, more so than to a family or a person. Lots of talk about class and inheritance and the new mobility of marriage. But James is really awkward in bringing these details to light in the novel. For example, rather than weaving it into the story or involving the fact somehow in the mystery, she just tells us that it's weird for someone to order someone else's servants around, or for a butler to be carrying someone's luggage. Good to know, but how does that relate to the story?! And I think that's where this book most failed for me. So little was related to the story itself. For a mystery novel, there was very little suspense or intrigue, and the red herrings and clues were very sloppily done. There was really no way of knowing the situation until the very end with a confession, and that often annoys me. And, I have to say it, I really wanted Mr. Darcy to be a detective storming through the field of justice, leaving no stone unturned in his quest to ensure that Right Prevailed at his beloved Pemberley. BUT THIS DID NOT HAPPEN. Instead, Darcy was more of a bystander and did no mystery solving. It was disappointing. Overall, this was not my favorite Pride & Prejudice continuation. Really, it's unlikely that even Austen could continue that book and make it as amazing as the original, so I wish people would stop trying. That way, poor sentimental sops like me could save some money here and there rather than impulsively buying books that can only disappoint. Really great novel if you want to learn about English social customs of the early 19th century, but if you're after more details on Lizzie and Darcy after marriage, then you're out of luck here. Ouch. If even JAMES makes the book sound horrible, then it's a bad sign. "I really wanted Mr. Darcy to be a detective storming through the field of justice"
Hah! Fantastic. And yeah, I haven't read any P&P spin-offs (aside from Pride & Prejudice & Zombies), but I'd heard this sucked. Alas. THERE WAS NO STORMING. Epic fail, I say. Epic. Fail. Well, it is lame as a mystery novel, too, completely apart from the P&P spin-off. Fizz??? O.M.G. I generally only like sequels written by the original authors (Nancy Drew notwithstanding), so I'm not surprised it was lame. Haha, I made the Fizz part up, I promise! That's exactly how I felt, so can't blame ya. I knew this book was poorly received but didn't know why until seeing your review. I will stay well away from it! I have this on hold at the library, but I think I'm going to skip it...at least for right now. I think 20 pages of recounting the plot of the original book would drive me crazy. Wouldn't one assume that if you're picking up a P&P sequel that you're familiar with the original?? Maybe I'll read it some day, but not in a big hurry right now. I KNOW! That was why the prequel annoyed me so much, too. That's what I hear. Just need to find one of those. I'm against third parties continuing stories for these very reason. It's good you found some positives in it though - maybe James should've written her own original novel set in the times? Yes, I wonder if the Pemberley setting felt very restrictive for her? Oh this sounds just awful in so many ways. I've never gotten why there are so very many Austen spin-offs. If we get just a few more of these kinds, perhaps it will stop. Yet I know this is a highly regarded author; perhaps she just lost her mind for a moment. Yes, I feel like people should leave Austen alone. Also vampires. I have yet to read a positive review of this, I think. But yours convinced me that I really ought to stay away. It is difficult to keep from caving when on an Austen high. It happens so often to me. But I agree, P&P continuations rarely live up to anything near the original. And I'm sad to here this isn't one of the better ones out there. Oh well. Guess I had better try a little harder at finally accepting this fact. Also, is it just me, or are Darcy and Elizabeth generally REALLY BORING and INSECURE in continuations? It puzzles me. You are so right! I've never thought about that, but I guess that's the only way to keep the "tension" alive in the plot? I just don't understand, though. I think I am going to skip them ALL from now on. Lesson learned. I haven't read this yet, even though every time I go into the store I am sorely tempted. I think your review though goes right to what's wrong with it , that other reviewers have also picked up on - the lack of a viable story/mystery, and that the characters don't come to life. And how could Darcy be anything but someone who strides about the field, taking charge? That is his character! And if there is no (or little) Lizzie and Darcy conversations, then I am not interested, since it is them I would read the book for. Good review, Aarti! thank you. I understand your temptation because the cover is so cute, and it seems so promising! Yeah, this was disappointing and really boring. Watching Darcy watch a trial is about as exciting as it sounds. Thanks for the warning. I might have been tempted. There actually IS NO DETECTIVE. I mean, there's a magistrate, but there is really no detecting. REALLY lame. Hmm, I have yet to read P&P (Austen month! Major catching up to do) but I'll make sure to skip this one. Thanks for the heads up! Had to go back and re-read my thoughts on this too; turns out I liked it better, but with some pretty severe reservations too. I think, though, I wasn't as disappointed because I generally hate Austen spinoffs, and I didn't actually hate this. I actually kind of enjoyed watching the contortions a very correct, upstanding family had to go through because of a murder happening in close proximity to them. And I found the trial to be really gripping, for some reason. That said, it wasn't a great P&P sequel (SOOO disappointed by Elizabeth) and it wasn't a great mystery novel (BORING and TRITE resolution, really) but it was, as you say, an investigation into social conventions, and an interesting piece that way.